This 52-year-old man presented with pain in the left upper quadrant and was found to have a 3.2-cm aneurysm of the distal splenic artery. During surgery, the aneurysm ruptured, and splenectomy was performed. Histology of the resected splenic artery revealed intimal fibroplasia. Routine 2-year follow-up showed an enlarging aneurysm of the hepatic artery. Contrast-enhanced axial CT images show several narrowings of the common and proper hepatic arteries with intervening aneurysmal dilatation. Note the circumferential, lobulated tissue that is thickening outside the intima. 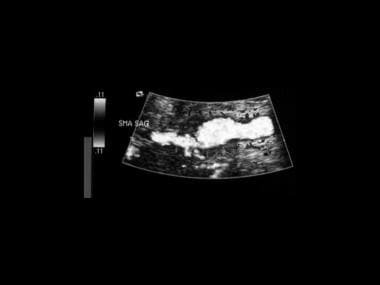 This was assumed to be a manifestation of intimal fibroplasia. Coronal reconstructions of CT images in the same patient as in the previous image. 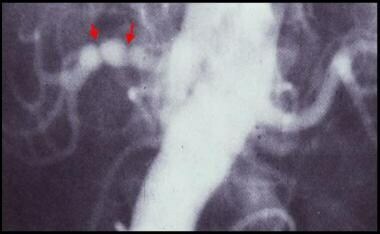 Three-dimensional gadolinium-enhanced magnetic resonance angiograms (MRAs) show medial fibroplasia, which appears as classic string-of-beads sign. This sign is due to multiple stenoses with intervening outpouchings that form a chain. In this case, the lesions involve the main right renal artery and the right accessory renal artery in a 37-year-old man with difficult-to-control hypertension. 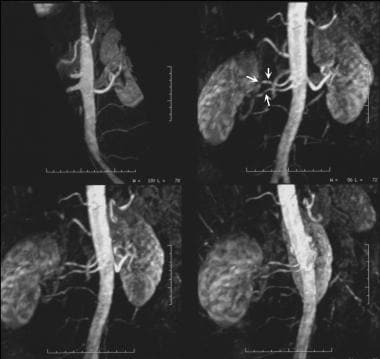 Conventional flush aortogram in a 47-year-old woman with difficult-to-control hypertension shows the characteristic string-of-beads sign of the right renal artery due to medial fibroplasia. 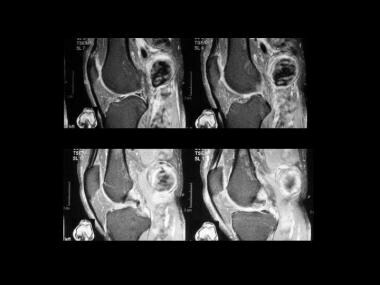 Local and regional preferences differ regarding the use of CTA vs MRA for cross-sectional imaging. However, as a group, radiologists are using MRA in place of contrast-enhanced angiography as the diagnostic modality of choice. With both CTA and MRA, mild FMD or FMD in the accessory arteries may be missed; therefore, it is still likely that contrast-enhanced angiography is the criterion standard. Data support the superiority of MRA over duplex Doppler ultrasonography (US) in patients with uremia associated with RAS, though the data do not specifically apply to FMD. As availability increases, MRA will likely become the screening test of choice in the diagnosis of RAS, including FMD. Hypertensive urography is of historical interest and is no longer used as a screening technique for RAS. Likewise, plain-film radiography has a limited role in patients presenting acutely as a result of mesenteric ischemia, which is a rare complication of FMD. Renal arteriography can be performed by using conventional or digital subtraction technique. Angiography is particularly indicated when vascular intervention is contemplated. Carbon dioxide has recently emerged as an alternative angiographic contrast agent for use in combination with digital subtraction angiography (DSA) to avoid the risk of conventional nephrotoxic contrast agents in patients with severe renal insufficiency. See the sequence of images in a single patient, below. A 28-year-old man presented with episodic, postprandial abdominal pain, hypertension, ischemic changes in the right toes, and a pulsatile swelling behind the knee. In this ultrasonogram, the superior mesenteric artery has a beaded appearance. Angiogram of the same patient as in the previous image confirms that the superior mesenteric artery has a beaded appearance. A popliteal artery aneurysm depicted by MRA and angiography (same patient as in the previous image). A popliteal artery aneurysm seen on coronal T2-weighted images. The resected popliteal artery aneurysm showed intimal fibroplasia (same patient as in the previous image). FMD may involve any layer of a visceral artery, and it may be classified on the basis of the primary involvement of the arterial wall. The classification system includes intimal, medial, or adventitial fibrosis. The medial variety can be subdivided. In 1967, McCormack et al histologically classified FMD on the basis of the primary site of involvement of the arterial wall. Their classification of fibrosing lesions of renal arteries included the categories of intimal fibroplasia, medial fibrosis with microaneurysms, subadventitial fibroplasia, and fibromuscular hyperplasia. 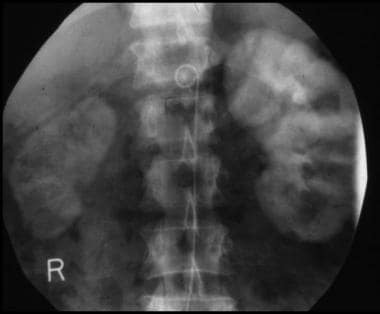 They coined the term chain of beads to describe radiographic changes in medial fibroplasia of the renal artery. The term has subsequently been modified to string of beads. Medial fibroplasia is the most common type of FMD and represents 80-95% of cases. The string-of-beads sign is classically seen in medial fibroplasia. Subadventitial fibroplasia can have a similar radiographic appearance. However, in this variant, the size of the aneurysms does not exceed the diameter of the renal artery. Medial fibroplasias may appear as a single stenosis of a visceral artery, but it is most often seen as multiple stenoses with intervening outpouchings that form a chain. This is radiographically depicted as the string-of-beads sign. Angiographic findings in systemic necrotizing vasculitis include 4 basic arterial anomalies: saccular microaneurysms (62%), arterial thrombosis (81%), arterial stenosis (81%), and luminal irregularities (90%). Alterations in the renal vascular flow are also observed in accordance with changes in the cortical medullary differentiation, heterogeneous nephrogram, and prolonged washout. Microaneurysms may regress after immunosuppressive therapy. With CTA or MRA, the physician may overlook mild cases of FMD. Most false-negative and false-positive results for RAS arise from accessory renal arteries. MRI is expensive, and its availability is limited. Measurements of the size of RAS on angiography (an important clinical consideration) may be imprecise and do not permit an assessment of the cross-sectional area or, most importantly, the flow through the stenotic segment. Some of these limitations may be overcome by using pressure measurements across the stenosis and by using intravenous US (IVUS). However IVUS has limited availability. The various histologic types of FMD are difficult to distinguish on angiograms; this difficulty has an important clinical bearing from a prognostic point of view. Doppler US is operator dependent, time consuming, and cumbersome. Several factors, including anatomic, technical, patient-related, and pathologic factors, can affect Doppler US. The false-positive and false-negative rates of hypertensive urography are too high for it to be used as a screening test for RAS. Acceptance of radionuclide renography as a primary screening tool for RAS has been hindered by the lack of standardized protocols. Plain radiographs have a role only when patients present acutely with bowel ischemia as a result of severe stenosis of the mesenteric arteries in association with thrombosis (see the images below). The radiographic findings include bowel distention, mucosal edema (shown as thumb printing), small-bowel pseudo-obstruction, gasless abdomen, pneumatosis, mesenteric and portal venous gas, and ascites. Conventional flush aortogram in a 43-year-old woman with difficult-to-control hypertension shows focal stenosis of the left mid renal artery; this finding may represent intimal fibroplasia. Fibromuscular dysplasia in a 36-year-old woman with difficult-to-control hypertension. Delayed nephrogram phase of a flush aortogram shows a substantially reduced right kidney. This 32-year-old man had fibromuscular dysplasia involving many arteries, including 1 renal, the carotid, the vertebral, right brachiocephalic, the right subclavian, and several intracranial arteries. He had severe renovascular hypertension and initially presented with a pulsatile mass in the right supraclavicular fossa. His hypertension responded to renal angioplasty. The aneurysm in the right subclavian artery was resected. Histologic examination of the resected specimen confirmed medial fibroplasia. The extent of the patient's intracranial disease precluded further surgery. For the evaluation of renal artery stenosis (RAS), hypertensive urography is performed by rapidly administering an intravenous bolus into a peripheral vein and taking sequential 1-minute radiographs for 5 minutes. Additional delayed radiographs may be obtained to assess the rest of the urinary tract. Extrinsic impression on the renal pelvis and or upper ureter from collateral vessels. Hypertensive urography is of historical interest only; it is no longer used as a screening technique for RAS because of its inconsistent results. The urogram may be normal in the presence of established RAS. The false-negative rate for hypertensive urography is 22%; the false-positive rate is 13%. Many scanning protocols are available. The general consensus is that both a timed bolus and a rapid injection rate improve image quality. No positive oral contrast material should be used because it severely degrades image quality. Immediately before the procedure, the authors' patients ingest water, and glucagon is then given intravenously to diminish bowel movement and maximize bowel distention. Some centers do not find this protocol essential. The 3 most common techniques used for 3D reconstruction are MIP, shaded surface display (SSD), and volume rendering (VR). MIP is often the single most useful technique for 3D reconstructions. Axial CT with sagittal and coronal reconstruction may elegantly depict visceral-artery aneurysms associated with arterial-wall thickening, as seen in fibromuscular dysplasia (FMD). Mesenteric occlusion is a rare complication of FMD. In an acutely ill patient, CTA may show either an arterial mesenteric occlusion or high-grade stenosis. Scrutinizing the axial CT images may show thickening of the bowel wall, pneumatosis, portal venous gas, or mesenteric hemorrhage. Accessory renal arteries are reliably identified by using CTA. RAS of either the mainstem artery or its intrarenal branches is detected with a high degree of accuracy. In patients with chronic symptoms that are possibly related to mesenteric angina, a normal celiac axis and superior mesenteric artery (SMA) virtually exclude mesenteric ischemia. However, in patients with moderate arterial stenosis, MRA may be more precise than CTA. Magnetic resonance angiography (MRA) produces excellent contrast-enhanced angiograms without the risk of iodinated compounds and without radiation exposure. MRA provides accurate information about the number of renal arteries, the size of the kidneys, and the presence of anatomic variants (see the images below). Gadolinium-enhanced MRA has high sensitivity for detecting stenosis in the main and accessory renal arteries. At present, MRA provides anatomic information regarding a vascular stenosis, but it provides little information about the functional significance of a stenosis. Andreoni et al expressed concern that CTA or MRA may cause mild cases of DSA-detectable FMD to be overlooked. Although false-negative studies in RAS are rare, stenoses tend to be overestimated, and a false-positive diagnosis may result. Phase-contrast MRA, a type of MRA based on accumulated phase differences, can be performed to somewhat compensate for this tendency. Both CTA and MRA may cause mild FMD or FMD in the accessory arteries to be missed. Therefore, contrast-enhanced angiography likely remains the criterion standard. Data about the use of ultrasonography, specifically in fibromuscular dysplasia (FMD), are limited. Most studies have been dedicated to the more common atheromatous stenoses of the visceral arteries (see the image below). The peak systolic velocity in normal renal arteries is 120 cm/s ± 12. With an average peak systolic aortic velocity of 60 m/s ± 15, both velocities decrease with age. The kidneys offer a low-resistance vascular bed; therefore, the Doppler spectral waveform from the normal kidney is that of a constant, forward, diastolic flow. In renal parenchymal disease, vascular resistance is increased; this results in a decrease in the diastolic flow component and an increase in the pulsatility of the Doppler spectral waveform. Parenchymal diastolic flow velocities of less than 20% of the peak systolic velocities are consistent with renal parenchymal disease. In RAS of whatever cause, the peak systolic velocity increases more than 150 cm/s for angles less than 60° or 180 cm/s for angles greater than 70°. Poststenotic spectral broadening may be present with or without flow reversal. Flow may be absent during diastole in stenosis of more than 50%. A ratio of the peak systolic renal artery velocity to the aortic peak systolic velocity of 3.5 or more is said to be predictive of >60% stenosis. Color flow Doppler images may demonstrate disorganized flow patterns and a high-velocity flow stream associated with hemodynamically significant stenosis. A false-negative diagnosis may occur with an accessory renal artery, whereas a false-positive diagnosis may be made when coarctation of the aorta is present. Color flow Doppler imaging is effective in demonstrating flow disturbance associated with tortuosity and stenosis at the origin of the celiac axis. Doppler spectral waveforms in a normal fasting celiac axis demonstrate a forward flow with an average peak systolic velocity of 123 cm/s ± 9 (age range, 48-79 y) associated with a significant increase in the systolic or diastolic flow velocity after a meal. This increase is also reflected in the hepatic and splenic arteries. The average postprandial systolic velocity 30 minutes after a meal of 355 kcal is 132 cm/s ± 7. In the presence of 60% celiac-axis stenosis, the peak velocity is increased to 167-208 cm/s ± 9. With this degree of stenosis, color Doppler imaging demonstrates a high-velocity jet at the stenotic site associated with poststenotic turbulent flow. The potential for collateralization between the celiac axis, the superior mesenteric artery (SMA), and the inferior mesenteric artery (IMA) is remarkable. As a result, the reading of peak systolic pressure in the celiac axis may be lower or higher than that expected when concomitant SMA occlusion is present. This feature may result in the overestimation or underestimation of ischemic disease. The fasting SMA demonstrates a low diastolic flow; however, after a meal, both the peak systolic and end-diastolic velocities show a tremendous increase in the absence of arterial stenosis. The normal fasting SMA velocities are 128 cm/s ± 16 (age range, 23-42 y). After a meal, the peak systolic velocity increases to 162 cm/s ± 11 with an end-diastolic velocity in the range of 48 cm/s ± 7 within 15 minutes after a meal. The peak systolic velocity almost doubles within 45 minutes after a meal. With significant SMA stenosis, the peak systolic velocity exceeds 270 cm/s, with a concomitant increase in diastolic flow. Color flow Doppler imaging shows a jet through the stenotic segment with turbulent flow downstream for some distance. By using color and pulsed Doppler evaluation of visceral artery aneurysms, turbulent arterial flow can be shown within the anechoic masses related to major visceral arteries. Diagnosing these aneurysms is essential because the mortality rate is as high as 82% with spontaneous rupture. Duplex US of the abdominal visceral arteries is perhaps the most technically demanding US procedure. This study has operator- and patient-related limitations, such as the operator's expertise and optimization of the equipment and the patient's habitus and preparation. Doppler US has several limitations in the diagnosis of RAS. These include patient-related factors (eg, bowel gas, obesity, respiratory renal movements, poor compliance), anatomic factors (eg, multiple renal arteries [16-28%], variation of renal veins used as imaging landmarks, horseshoe kidneys, crossed ectopia), technical factors (eg, false-positive results due to suboptimal angles, variation in operator experience, incomplete examination [because complete renal evaluation is cumbersome], need to visualize the entire length of artery, transmitted cardiac and/or aortic pulsation that may obscure renal waveforms, different emphasis on variable parameters), and pathologic factors (eg, false tracings recorded from large collateral vessels and reconstituted main renal artery, variable effects of RAS of different causes, including atheroma, fibromuscular hyperplasia, vasculitis, arteriovenous fistula, retroperitoneal fibrosis, and neurofibromatosis). Orificial stenoses and FMD may particularly difficult to interpret. US is a sensitive yet noninvasive technique that may provide useful information in mesenteric ischemia by demonstrating absent or barely visible color-flow arterial signals and thickened bowel wall loops. Doppler techniques are particularly useful for investigating chronic mesenteric ischemia. With RAS, a false-negative diagnosis may occur with accessory renal artery, whereas a false-positive diagnosis may be due to coarctation of aorta. There are several limitations of Doppler analysis of celiac-axis and SMA ischemia. First, the extensive potential for collateralization in splanchnic vessels may make assessment of a single vessel stenosis difficult. Second, the risk of error is increased when the angle of insonation used is greater than 60°. Third, careful placement of the sample volume is crucial. Unless the SMA is examined throughout, visualization of the vessel may result in a false-negative finding. A positive ACE-inhibitor radionuclide scan indicates that renovascular hypertension is present; it also implies the existence of hemodynamically significant RAS (>60-75% of the lumen). Standard renography with OIH has low specificity and sensitivity in the diagnosis of RAS, including stenosis from FMD. For RAS greater than 50%, Tc-MAG3-captopril renography has a sensitivity of 90%, a specificity of 91%, a positive predictive value of 70%, and a negative predictive value of 97%. In fibromuscular dysplasia (FMD), a result on positive captopril renography supports intervention, though hypertension is unlikely to be cured. However, the value of captopril renography for patients with significantly impaired renal function is not clear, and little evidence suggests that a positive test can be used to predict a favorable outcome from intervention in terms of preservation of renal function. The sensitivity and specificity of studies of the captopril renin test are 75-100% and 60-95%, respectively. A major limitation is the need to discontinue antihypertensive therapy, including ACE inhibitors, beta blockers, and diuretics, because they can affect the baseline plasma renin activity. The sensitivity of the test is also low, and its predictive value is less than that of a captopril renogram. Estepa et al examined 20 children (aged 5 days to 15 years) with hypertension whose diagnoses were confirmed on aortography. Captopril renograms and Doppler sonograms were initially obtained in only 8 children and suggested the diagnosis of RAS (7 with FMD). With standard radionuclide (OIH) renography, false-positive results can occur from conditions that cause unilateral reduction in blood flow. These include chronic pyelonephritis, renal-outlet obstruction, renal-vein thrombosis, compression of the renal hilum, perirenal abscess, perirenal hematoma, and ptosis of the kidney. Patients with renovascular hypertension may have false-negative captopril renograms after the long-term administration of captopril despite adequately maintained blood pressure. Therefore, when possible, ACE inhibitors should be discontinued before captopril renography is performed. Overhydration may result in false-negative findings, and underhydration may result in a false-positive finding. Bilateral RAS may be difficult to diagnose. Poor renal function most often results in a nondiagnostic examination. An asymmetric, small kidney with poor function is often unresponsive to captopril renography. Indications for renal artery interventions are determined on the basis of clinical, anatomic and physiologic criteria. Anatomic criteria are stenosis greater than 60% of the diameter, poststenotic dilatation, collateral circulation, and diminished renal size. Physiologic criteria are abnormal radionuclide scan, lateralizing renal vein renin, duplex US findings, and transstenotic pressure gradient (during angiography, >10% peak systolic). When the stenosis is 70%, it is most likely hemodynamically significant, and no pressure measurement is needed. For 50-70% stenosis, the pressure gradient should be determined before intervention. Flush aortography is usually performed in the anteroposterior and slight left anterior oblique projections to best visualize the origins of the renal arteries. If the main renal arteries are normal, selective renal arteriography should be performed in the anteroposterior and contralateral oblique projections by using the magnification technique to best define renal-branch stenoses. Intimal fibroplasia affects the main renal artery and major segmental arterial branches. It is often bilateral and characterized by narrow annular radiolucent bands associated with poststenotic fusiform dilatation. Medial fibroplasias also involve the main renal artery and larger branches, often bilaterally; it is characterized by the classic string-of-beads sign with alternating areas of stenoses and intervening aneurysmal dilatation. A single focal stenosis may occur. Subadventitial fibroplasia usually affects the distal main renal artery and is characterized by long irregular stenosis. There may be associated beading, but usually there is no aneurysm formation. The diameter of beads is not wider than the normal diameter of artery. Celiac, hepatic, splenic, left gastric, SMA, and IMA stenoses caused by FMD are rare, but all of these have been reported. The angiographic appearances are similar to those seen in RAS. When stenosis occurs at these sites, the collateral circulation is more obvious on angiograms, as a result of rich potential pathways between the celiac axis and the SMA and IMA. Ischemic kidneys release high levels of renin in their veins. Renal venous sampling for measuring renin levels to compare the venous drainage from each kidney can be used to predict the degree of renal ischemia and the potential success of revascularization. A 1.5-fold increase in renin level in the ischemic kidney constitutes a positive result; in such cases, use of revascularization to treat elevated blood pressure will likely be successful. Renin secretion in the contralateral kidney is suppressed, as evidenced by the similar levels of renin measured in the renal artery, infrarenal inferior vena cava and renal vein. In approximately 10% of healthy patients, the ratio is above 1.5; in fewer than 20% is the ratio below 1.1. The accuracy of the measurements may be improved with the prior administration of an ACE inhibitor, which increases renin secretion on the affected side. False-negative and false-positive results are frequent. Although more than 90% of patients with unilateral RAS and increased renin levels in the affected renal vein have a positive response to angioplasty or surgery, approximately 50% of patients with nondiagnostic findings also benefit from revascularization. As a result, most clinicians rely on the clinical index of suspicion rather than renal vein renin measurements to estimate the physiologic significance of RAS. However, renal renin vein measurements may still be useful in patients with bilateral RAS, in whom measurements may determine the side that contributes most to the hypertension. Renal angiography remains the criterion standard for the diagnosis of RAS. Angiography is an essential step when renovascular intervention is contemplated. Angiography only provides anatomic information; it does not allow assessment of blood flow through the stenosis. Angiography may lead to an underestimation of the severity of renal artery obstruction, which is better assessed by means of pressure measurements. On occasion, carbon dioxide angiography cannot be used to image a particular segment of a renal artery because of superimposed bowel gas. 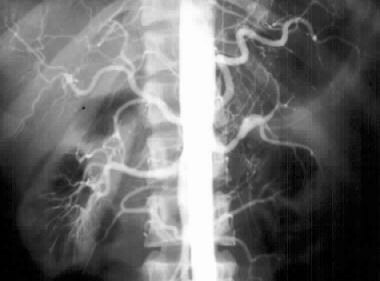 Artifact caused by moving structures such as peristalsis on digital subtraction angiography (DSA) may be mistaken for RAS. Begelman SM, Olin JW. Fibromuscular dysplasia. Curr Opin Rheumatol. 2000 Jan. 12(1):41-7. [Medline]. Curry TK, Messina LM. Fibromuscular dysplasia: when is intervention warranted?. Semin Vasc Surg. 2003 Sep. 16(3):190-9. [Medline]. Kim ES, Serhal M. The Diagnosis and Treatment of Fibromuscular Dysplasia: An Update for Cardiologists. Curr Treat Options Cardiovasc Med. 2016 Jun. 18 (6):37. [Medline]. Olin JW, Froehlich J, Gu X, Bacharach JM, Eagle K, Gray BH. The United States Registry for Fibromuscular Dysplasia: results in the first 447 patients. Circulation. 2012 Jun 26. 125(25):3182-90. [Medline]. Lewis S, Kadian-Dodov D, Bansal A, Lookstein RA. Multimodality imaging of fibromuscular dysplasia. Abdom Radiol (NY). 2016 May 23. [Medline]. Chehab BM, Gupta K. Contemporary diagnosis of carotid fibromuscular dysplasia: role of power Doppler and a review of other diagnostic modalities. Rev Cardiovasc Med. 2013. 14 (2-4):e136-43. [Medline]. Olbricht CJ, Paul K, Prokop M, et al. Minimally invasive diagnosis of renal artery stenosis by spiral computed tomography angiography. Kidney Int. 1995 Oct. 48(4):1332-7. [Medline]. Saw J, Bezerra H, Gornik HL, Machan L, Mancini GB. Angiographic and Intracoronary Manifestations of Coronary Fibromuscular Dysplasia. Circulation. 2016 Apr 19. 133 (16):1548-59. [Medline]. Leung DA, Hoffmann U, Pfammatter T, et al. Magnetic resonance angiography versus duplex sonography for diagnosing renovascular disease. Hypertension. 1999 Feb. 33(2):726-31. [Medline]. Prince MR, Schoenberg SO, Ward JS, et al. Hemodynamically significant atherosclerotic renal artery stenosis: MR angiographic features. Radiology. 1997 Oct. 205(1):128-36. [Medline]. Papachristopoulos G, Bis KG, Shetty AN, et al. Breath-hold 3D MR angiography of the renal vasculature using a contrast-enhanced multiecho gradient-echo technique. Invest Radiol. 1999 Dec. 34(12):731-8. [Medline]. Leadbetter WF, Burkland CE. Hypertension in unilateral renal disease. J Urology. 1938. 39:611-25. Dunick NR. Renovascular Hypertension: Text of Uroradiology. 3rd ed. Philadelphia, PA: Lippincott William & Wilkins;. 2001: 215. Lassiter FD. The string-of-beads sign. Radiology. 1998 Feb. 206(2):437-8. [Medline]. Avasthi PS, Greene ER, Scholler C, Fowler CR. Noninvasive diagnosis of renal vein thrombosis by ultrasonic echo-Doppler flowmetry. Kidney Int. 1983 Jun. 23(6):882-7. [Medline]. Taylor DC, Kettler MD, Moneta GL, et al. Duplex ultrasound scanning in the diagnosis of renal artery stenosis: a prospective evaluation. J Vasc Surg. 1988 Feb. 7(2):363-9. [Medline]. Berland LL, Koslin DB, Routh WD, Keller FS. 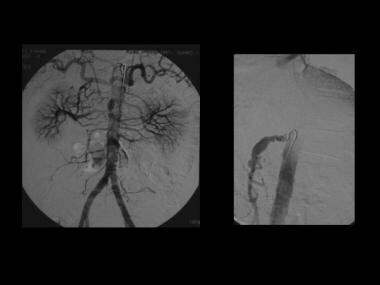 Renal artery stenosis: prospective evaluation of diagnosis with color duplex US compared with angiography. Work in progress. Radiology. 1990 Feb. 174(2):421-3. [Medline]. Nazzal MM, Hoballah JJ, Miller EV, et al. Renal hilar Doppler analysis is of value in the management of patients with renovascular disease. Am J Surg. 1997 Aug. 174(2):164-8. [Medline]. Fu W, Crockett A, Low G, Patel V. Internal Carotid Artery Web: Doppler Ultrasound with CT Angiography correlation. J Radiol Case Rep. 2015 May. 9 (5):1-6. [Medline]. Dondi M, Fanti S, De Fabritiis A, et al. Prognostic value of captopril renal scintigraphy in renovascular hypertension. J Nucl Med. 1992 Nov. 33(11):2040-4. [Medline]. Roccatello D, Picciotto G, Rabbia C, et al. Prospective study on captopril renography in hypertensive patients. Am J Nephrol. 1992. 12(6):406-11. [Medline]. McCormack LJ, Dusten JP, Meaney TF. Selected pathology of the renal artery. Semin Roentenol. 1967. 2:126-38. Yamaguchi R, Yamaguchi A, Isogai M, et al. 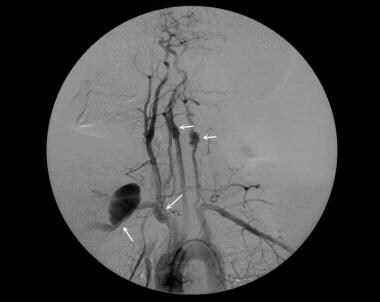 Fibromuscular dysplasia of the visceral arteries. Am J Gastroenterol. 1996 Aug. 91(8):1635-8. [Medline]. Wagner WH, Allins AD, Treiman RL, et al. Ruptured visceral artery aneurysms. Ann Vasc Surg. 1997 Jul. 11(4):342-7. [Medline]. Goncharenko V, Gerlock AJ, Shaff MI, Hollifield JW. 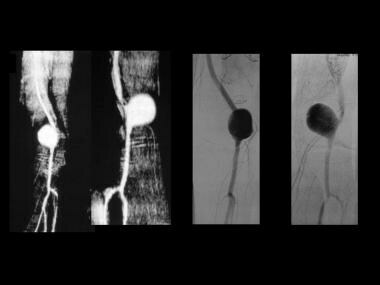 Progression of renal artery fibromuscular dysplasia in 42 patients as seen on angiography. Radiology. 1981 Apr. 139(1):45-51. [Medline]. Cragg AH, Smith TP, Thompson BH, et al. Incidental fibromuscular dysplasia in potential renal donors: long-term clinical follow-up. Radiology. 1989 Jul. 172(1):145-7. [Medline]. Matsushita M, Yano T, Ikezawa T, et al. Fibromuscular dysplasia as a cause of abdominal aortic aneurysm. Cardiovasc Surg. 1994 Oct. 2(5):615-8. [Medline]. Kaatee R, Beek FJ, Verschuyl EJ, et al. Atherosclerotic renal artery stenosis: ostial or truncal?. Radiology. 1996 Jun. 199(3):637-40. [Medline]. Verswijvel G, Van Hoe L, Stockx L, Oyen R. Magnetic susceptibility artifacts by titanium surgical clips mimicking fibromuscular dysplasia of the renal artery in a kidney transplant. Eur Radiol. 2000. 10(3):543. [Medline]. Gowda MS, Loeb AL, Crouse LJ, Kramer PH. Complementary roles of color-flow duplex imaging and intravascular ultrasound in the diagnosis of renal artery fibromuscular dysplasia: should renal arteriography serve as the "gold standard"?. J Am Coll Cardiol. 2003 Apr 16. 41(8):1305-11. [Medline]. Stavros AT, Parker SH, Yakes WF, et al. Segmental stenosis of the renal artery: pattern recognition of tardus and parvus abnormalities with duplex sonography. Radiology. 1992 Aug. 184(2):487-92. [Medline]. Kohler TR, Zierler RE, Martin RL, et al. Noninvasive diagnosis of renal artery stenosis by ultrasonic duplex scanning. J Vasc Surg. 1986 Nov. 4(5):450-6. [Medline]. Maini A, Gambhir S, Singhal M, Kher V. Aspirin renography in the diagnosis of renovascular hypertension: a comparative study with captopril renography. Nucl Med Commun. 2000 Apr. 21(4):325-31. [Medline]. Stanley JC, Gewertz BL, Bove EL, et al. Arterial fibrodysplasia. Histopathologic character and current etiologic concepts. Arch Surg. 1975 May. 110(5):561-6. [Medline]. Iwai T, Konno S, Hiejima K, et al. Fibromuscular dysplasia in the extremities. J Cardiovasc Surg (Torino). 1985 Sep-Oct. 26(5):496-501. [Medline]. Insall RL, Chamberlain J, Loose HW. Fibromuscular dysplasia of visceral arteries. Eur J Vasc Surg. 1992 Nov. 6(6):668-72. [Medline]. Rafalowska J. Genetically determined vascular diseases. Folia Neuropathol. 1999. 37(4):210-6. [Medline]. Distribution of various types of fibromuscular dysplasia.